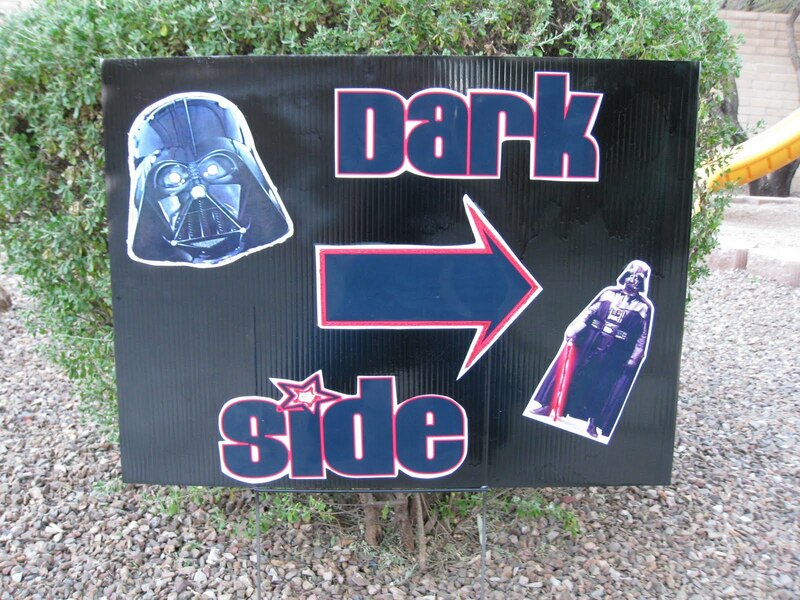 Here are some ideas for a Star Wars party. I will be adding more pictures as I come across them. I read about Yoda soda on some other sites, so here is how mine turned out. For the Darth Vader pinata, I bought a Halloween pinata on clearance for $3.00 and adding a mask, spray painted it black and added a cape made from Shiny material. It wasn’t perfect, but it was cheap and the kids loved it! Gift Bags: I bought colorful bags from Michael’s craft store with my coupon. My one regret was making custom gift bags for each person that RSVP’d. As the names would come in, I would label the bag with a marker on the back. But….when one kid didn’t show up and another sibling came and needed a goody bag, I had to cross out the name and write a new one. After the party, I vowed to make generic bags the next time! I printed out clip art of Star Wars characters onto glossy photo paper (from Costco) and pasted them onto the bags while outlining them with silver puffy paint. It actually stuck and didn’t fall off. To make the Darth Vader cape, I bought shiny material from Joann’s fabrics and cut them and stapled them to each Darth Doll (printed on photo paper). I covered the staple with silver paint and then added a sparkly red light saber (from pipe cleaner). I also attached the “doll” with a scrap booking clothespin so the kids could remove the Darth doll and play with it. I ended up making about 45 of these custom bags. They covered our entire dining table!